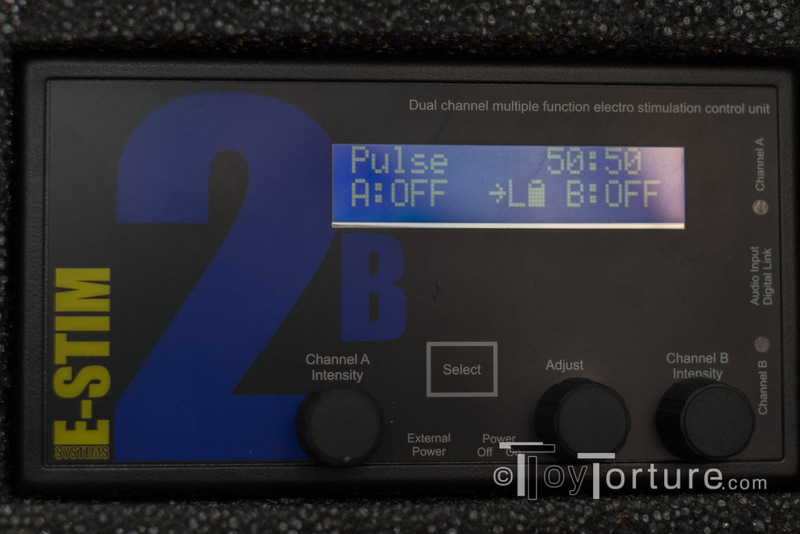 One of the most asked question regarding E-Stim is if the 2b is a good power unit. Since for a long time I haven’t had a chance to play with one I am very glad that E-Stim System provided me with a review sample for this year’s E-Stim Special. Since this review was written, E-Stim Systems renamed the Pro Pack Bonus Pack, but the content stayed the same. 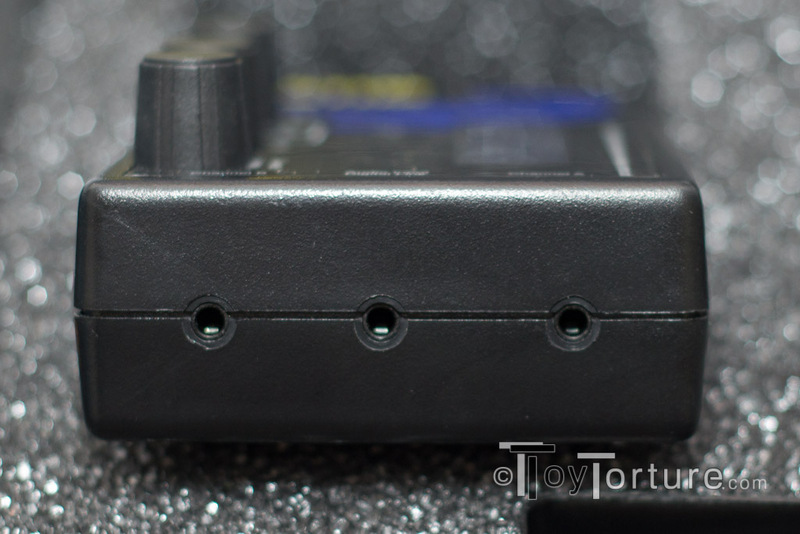 The 2b Pro Pack comes in a nice sturdy black box which with just a few modifications can also house some basic e-stim toys like sounds or conductive loops. Inside the storage box is the 2b power unit, a power supply unit with adaptors for the most common plug systems, a 9V battery, two 4mm banana plug leads, an audio CD with music for the audio input of the power box, the cable to connect your 2b to your PC, an USB stick with the connection and the remote control software which you need to update the firmware of your box and of cause a detailed printed manual. The 2b power box itself is a black box which measures 145x80x35mm. On top on the right side there is a blue back light LCD. It shows the selected program, the adjustments done to the program (50:50 is the default value; the first value is for just turning the adjust knob, the second for when pressing the select button and turning the adjust knob), the output level of both channel, the selected output mode (low and high) and the battery status. Below that screen are three knobs and a button. 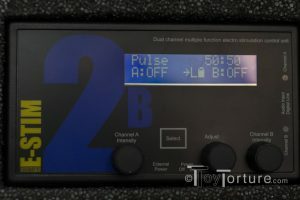 The knobs from the left to the right control the intensity for channel A (under which the input of the internal mono microphone is located), the adjustment knob which manipulates the programs and the control for the intensity of channel B. If you press the button labeled select you enter the menu. By turning the adjustment know you can scroll through the different programs which you select by pressing the “Select” button again. After the different programs you reach the different setting menus where you can adjust the output level, engage the tri-phase mode, adjust the backlight or active the remote control mode. On the far right side of the top there are two LEDs which flesh in time with the stimulation. On the front side there is a slider to activate the box and the input for the external power supply. 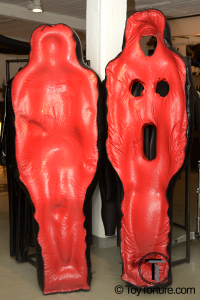 On the right side there are three 3.5mm jackets. The left jacket is the output for the second channel, the middle is the input for the audio or the digital connection and the right is the output for the first channel. On the bottom of the box there is the lid under which the battery can be put. Using the box is similar to other quite easy: Turn the box on using the slider and wait 7 seconds for it to boot while it makes a self check and it is ready for play. Then connect the leads to the electrodes, connect them to the box, select a program (the box boots by default into Pulse) and slowly increase the intensity on the desired channel. The 2b has 17 different programs. The sensation of the programs can be adjusted in two ways with different effects by either turning the adjust know or pressing down the select button while turning the adjust know. Throb A throbbing sensation Intensity of the throb. Thrust A thrusting sensation Intensity of the thrust. Tickle A tickling sensation. The faster you turn the knob, the more intense the tickling become. Stereo Input Creating sensations out of the input (p.e. music) from the 3.5mm jacket. The sensation from channel A are representations of the left stereo channel, channel B of the right. In order to allow for a varied sensation the input volume mustn’t be too high or too low. Sharpness of the response. I have to be honest: My first impression of “Well, I max that box pretty quickly.” Then changed the output level to high, used the external power supply which gives an additional 30% power boost and I quite enjoyed it. Yet in order to really love the box you really need to get to know it (like actually all sophisticated digital e-stim boxes). Once you start experimenting with the different modifications through the adjustment knob and the feel of the sensation with select+adjust a whole new world opens up from soft sensation that slowly bring more and more pleasure until I came up to excruciating pain scenes. That being said this is not a power unit you buy, take out of the packaging and have all the fun. Of cause the standard settings are good and will get you off well but to truly unleash the potential of this box it takes quite some (very entertaining) time. Especially when you are starting out with this box, one thing that takes a bit time to get used to are the controls. The resistance of the control knobs is a bit strong so it is hard to turn up the intensity quickly. Also: Once you press the “Select” button the stimulation stops until you select a new one which as a safety precaution starts at 1% intensity which at least for my play style is a bit annoying. But as soon as I got used to it, I adjusted my play style and it didn’t bother me anymore. What sets the 2b apart from other power boxes is the remote control feature. You can connect your box to you computer using the USB-link cable included in the Pro Pack (which can be purchase separately for £89) and than either control is via your computer or let someone else control it over the internet. E-Stim System says this feature is still in beta status so be prepared for problem. 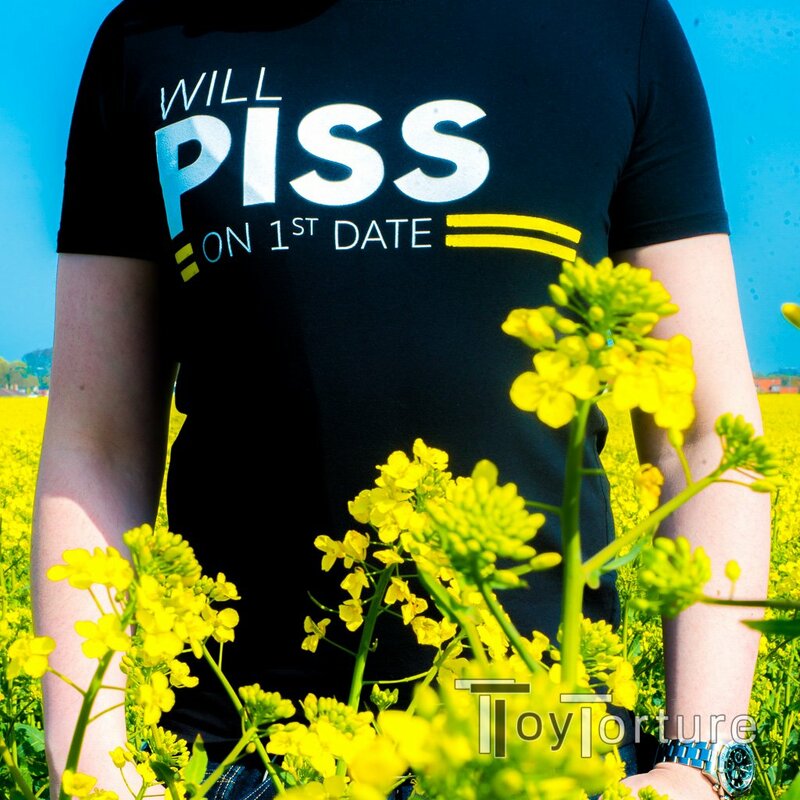 During my test I didn’t experience any but this might not be the rule. During Erofame this year, E-Stim Systems introduced a new remote control service called „Connect“ which is more realiable and easier to control than the old Commander. You can read everything out it here. The box comes with a lifetime warranty and after a bit chaotic group scene I can assure you that it is sturdy build enough for limited impact (though try not to be like me a knock it down a table thrice one evening!). Conclusion: Powerful, flexible yet a bit hard to control e-stim power box. 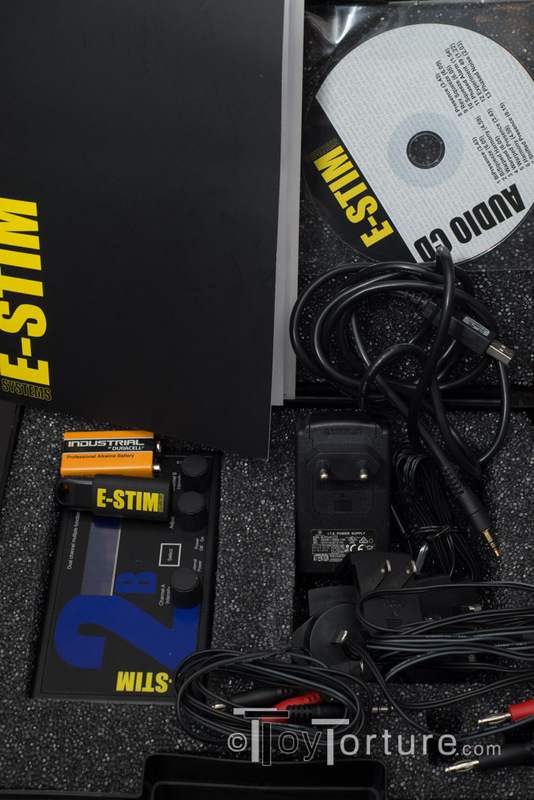 Tagged E-Stim, E-Stim System. Bookmark the permalink.